Home Animals Eco Eco System Environment Future Ideas Questions Science Technology Can We Secure Bees' Future By Tracking Them? Can We Secure Bees' Future By Tracking Them? Colony Collapse Disorder may sound like the name of a dystopian science fiction novel, but it's a real and present danger to the planet. For years, honey bees around the globe have been wandering from their hives and dying for no apparent reason. In some countries, 50% of hives have committed this odd kind of suicide. Nobody knows exactly why the bees are getting confused; various reports have fingered particular pesticides, antibiotics and cellphone signals, or maybe all of the above. A big part of the problem: scientists don't really know where honey bees are going when they die. That seems surprising: how can anything escape our attention on this GPS-driven, NSA-monitored planet? Couldn't we just, you know, stick RFID chips on the bees? As much as that seems like an idea that emerged after one too many bong hits, it makes scientific sense — and now a group of Australian researchers are trying it out. 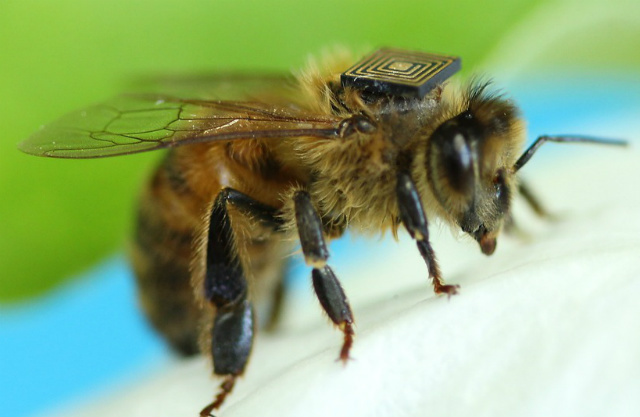 They've attached 0.1-inch-wide sensors, above, to the backs of 5,000 honey bees in Tasmania. The chips will transmit location data in real time. (The researchers had to refrigerate the bees for a few minutes first, and shave the ones that were too hairy for the chips to stick). "This is a non-destructive process and the sensors appear to have no impact on the bee's ability to fly and carry out its normal duties," said Dr. Paulo de Souza, who's heading up the bee trials at Australia's national science agency, known as the CSIRO, in a press release. "Bees are social insects that return to the same point and operate on a very predictable schedule," de Souza added. "Any change in their behaviour indicates a change in their environment. If we can model their movements, we'll be able to recognize very quickly when their activity shows variation and identify the cause." The CSIRO's ambition doesn't stop at bees. The organization, one of the world's largest scientific agencies, is aiming to shrink the RFID chips down to a mere tenth of a millimeter — so it can start tracking mosquitoes and fruit flies too.